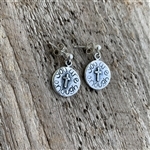 Christian earrings are a simple way to display your faith every day. Our gorgeous, handcrafted sterling silver cross earrings are casual enough to wear with jeans and a tee, and elegant enough to wear with an evening dress and heels. You can’t go wrong accessorizing sterling hoop earrings with your outfit – day or night! With the Christian fish, crosses and other important religious symbols, these Christian earrings subtlety allow you to showcase your faith. 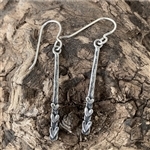 Perhaps the physical reminder realigns your daily walk and helps encourage you of your faith, or you may enjoy the way a piece of jewelry can bring about conversation with a non-believer – whatever your reason for choosing religious earrings, buy high quality, unique pieces from Visible Faith Jewelry. With so many options out there of Christian jewelry for women, it’s important to find a company that truly hopes to bless you with their products. 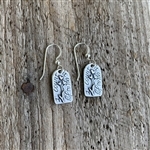 Texas designer, Shandon Camarillo-Whitson uses only high quality sterling silver in her jewelry that she handcrafts in Texas. Along with attention to detail and quality, Shandon also prides herself in donating a portion of all proceeds to various philanthropic and charitable causes, including missions and Christian schools. 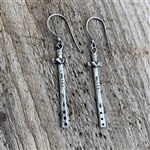 Shop Visible Faith Jewelry’s beautiful sterling earrings and Christian jewelry for women now!